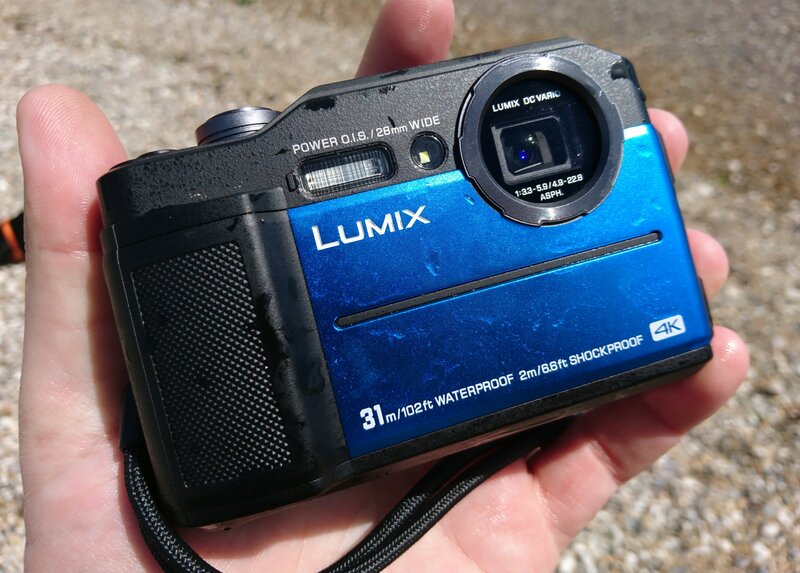 We publish our review of the new Panasonic Lumix FT7, the camera is waterproof to 31m and has a built-in EVF. The FT7 has a 20mp sensor, and records 4K video. On paper, the Panasonic Lumix FT7 has all the features you could possibly want, with high-speed shooting, 4K video, and a 4.6x optical zoom lens, but this waterproof camera is ultimately let down by disappointing image quality. Panasonic’s new Lumix FT7 is the long awaited update to the FT5 / FT6, and is Panasonic’s premium waterproof tough camera, being waterproof down to 31m, as well as shockproof, freezeproof, crushproof and dust proof. The FT7 (TS7) is available from around £399. There's a high-resolution 20.4mp 1/2.3inch "Live MOS sensor" and this is an update compared to the 16mp FT5. 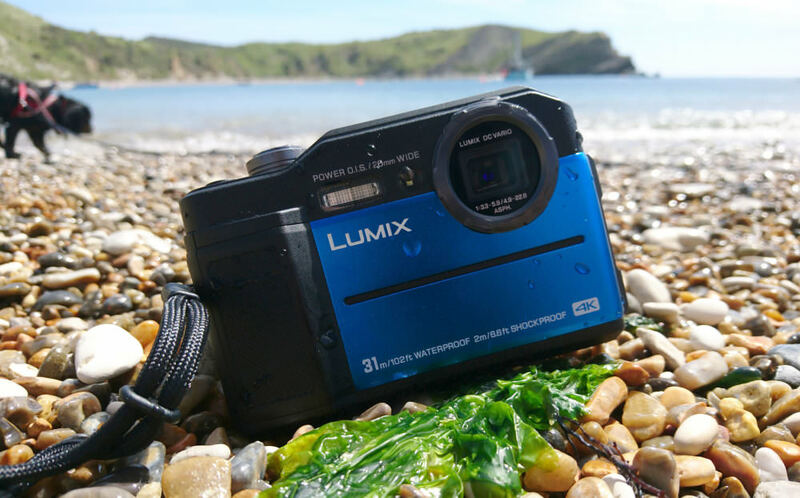 The FT7 is known as the TS7 in the US, and sits at the top of the tough camera range, with the Panasonic Lumix FT30, Panasonic's budget waterproof camera, still available for around £125. 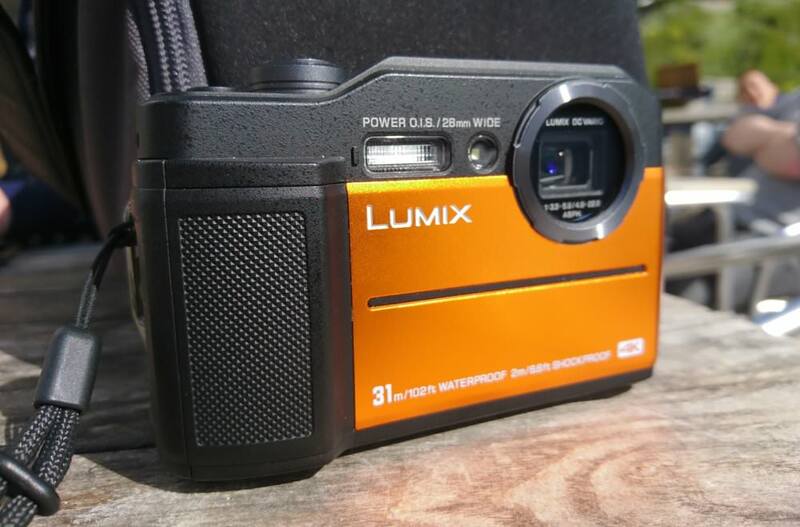 The camera features the same specification 4.6x optical zoom ASPH. lens as the FT5/6 and is a 28-128mm equivalent, with f/3.3-4.9 aperture, Power O.I.S (Optical Image Stabilisation), and a 5cm macro mode. The lens does not features Leica branding. The FT7 records 4K UHD video at 30, 25 and 24fps, with stereo sound and optical zoom available. High speed 720p (1280x720) HD video can be recorded at 120/100fps. 4K photo shoots at 30fps, with post focus. There's also the ability to shoot at 30fps, and then choose which 8mp photo(s) you want to save as JPEG images. The FT7 is the only waterproof camera with an electronic viewfinder (EVF) – this features dioptre adjustment, but does not feature eye detection. Underwater this could be activated when not needed, so a button is used to switch between the screen and the EVF - which Panasonic call the LVF (Live ViewFinder). There's a 3inch screen with 1040K dot resolution, with tempered cover glass to withstand the high water pressure at 31m. 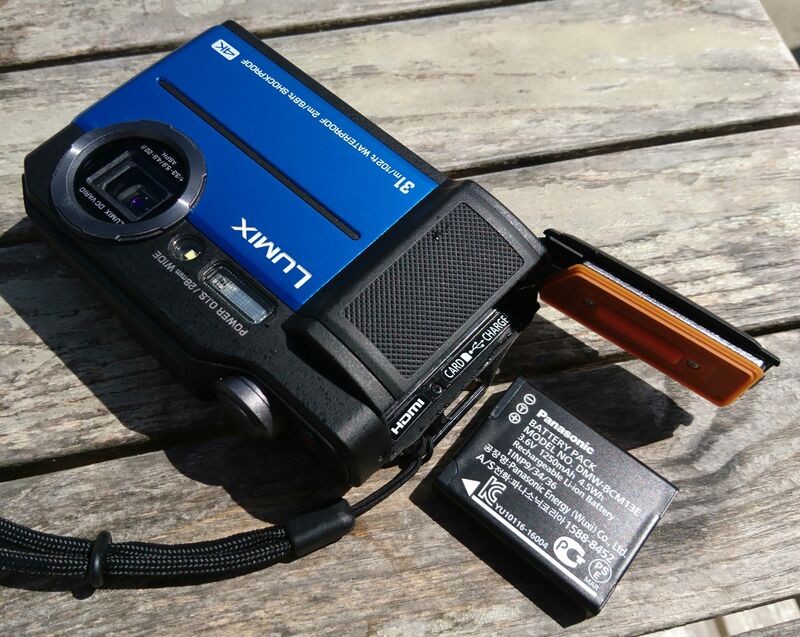 USB charging is included so you can quickly charge the camera where-ever you are. There is no raw shooting mode. 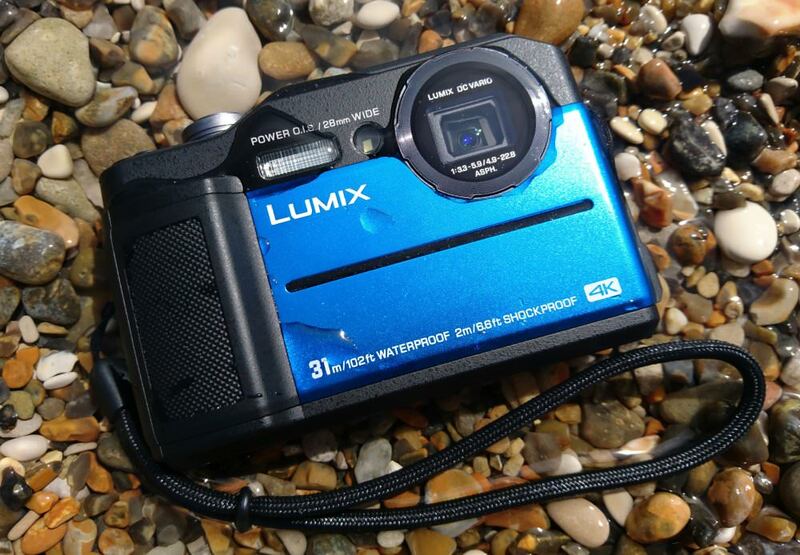 Priced at £399, it goes up against the 12mp Olympus Tough TG-5 (15m waterproof), and 16mp Nikon Coolpix W300 (30m waterproof). 4.6x optical zoom lens, f/3.3-4.9, 28-128mm equiv. On top of the camera you'll find stereo microphones, a large textured shutter release button, the video record button and the on/off button. On the back of the camera there are a number of controls, including two customisable Function (Fn) buttons. Starting from the top left, you have the Post Focus / Fn2 button, LVF (used to switch between the screen and electronic viewfinder), and the EVF with dioptre adjustment. On the right hand side there is a W-T zoom control, Mode button, Playback, 4K / Fn1 button, followed by DISP, a 4-way controller with middle MENU/SET button, and underneath this the Delete / Q.Menu (Quick Menu) button. The 4-way controller gives quick access to exposure compensation, flash, macro and drive mode. The Quick Menu button brings up quick access settings on the rear screen so that you don't need to go in to the menus every time to change settings. The menus are clearly laid out with colour coded sections, and there are built-in hints and tips to explain the options, which makes it easier to use the camera. The top EVF gives the FT7 considerable bulk and the front of the camera has a large textured grip. There are a number of textured areas on the camera to aid grip, including the top (left), front grip, and right hand side. 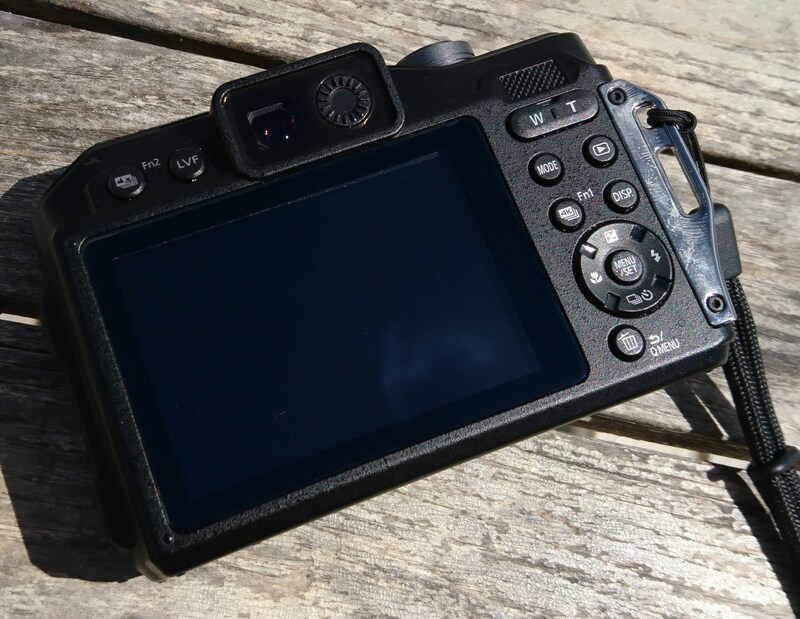 The screen is quite clear outdoors in bright light, but there are occasions when the electronic viewfinder becomes extremely useful, especially in very sunny weather. Despite the small size (compared to a DSLR or mirrorless camera with EVF) the EVF is clear and detailed. It’s a chunky camera, with tough plastic construction and measures 116.7x76.1x37.3mm, and weighs 319g with battery and SD card. This makes it bigger than the Olympus Tough TG-5, and Nikon Coolpix W300 (which is the smallest of the three). The battery and memory card compartment also features an HDMI connection, and MicroUSB (which can be used for charging). The compartment is double locking, so as to avoid accidentally opening it. The camera offers 300 shots when using the LCD screen, or 250 shots when using the EVF. Underneath the camera is a plastic tripod socket. No samples or indication of how it fares underwater, which surely must be one of its principal attractions? Having said that, unless it can focus and deliver reasonable results in poor light [which seems unlikely], its depth specification is probably most useful for bragging. Otherwise an expensive tough camera in a sector [the compact sensor camera] which is facing extinction. No samples or indication of how it fares underwater, which surely must be one of its principal attractions? Having said that, unless it can focus and deliver reasonable results in poor light [which seems unlikely], its depth specification is probably most useful for bragging. Otherwise an expensive tough camera in a sector [the compact sensor camera] which is facing extinction. 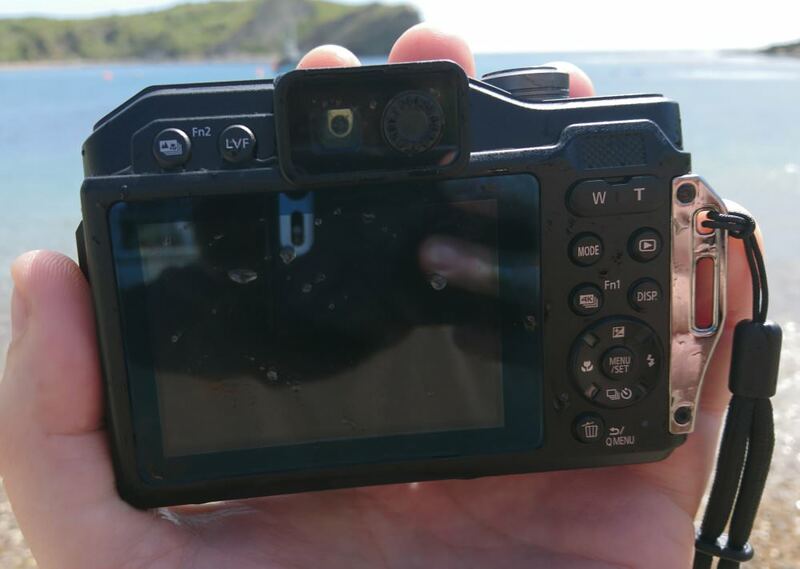 The camera survived several hours (2-3 hours) coasteering and kayaking in the sea. However, there wasn't much underwater that was visible in the sea to take photos of. I suspect, like with watches, the depth guide relates to pressure. Eg a watch waterproof to 10bar has a waterproof rating of 100m (if I recall correctly). My point is that this depth is not recommended. Any movement under water acts to exponentially increase the pressure on the object being moved. Consequently, I’d be surprised if the camera was ever intended for anything other than snorkelling. watch repairers say that waterproof 100M means : "swim 50M away from the beach and swim back 50M to get out of the sea"